I often say to the girls “just stop and think”! And my hubby often says to me “just stop thinking”! Thinking. It’s so important isn’t it. It helps us to make good decisions. It makes us calculate the risks, assess the consequences, weigh up the pros and cons, analyse the outcomes. That’s a good thing, right? Thinking is not always all it’s cracked up to be. In fact thinking too much can be as dangerous as not thinking enough. I know, because I am a self-confessed over-thinker. If you are an over-thinker then you never switch off. And just like a lightbulb that is never switched off, you eventually burn out. Being a female juggling machine I’m always thinking at least three steps, three hours, three days, three weeks, three months, three years ahead. Ideas, thoughts and plans pop into my head at all times of day and night. Usually followed by the feelings that go with them, because I am human, and whether I like it or not, with each thought comes a feeling. Sometimes it’s excitement, sometimes it’s fear, or it might be happiness, or worry, or frustration. Whatever it is, a thought or a feeling, it’s there filling the space between the ears and leaving no time for just being. Just existing. Over-thinking is a habit. Once you start, it’s hard to stop. And it’s a habit I know I am not alone in. So, after a long period of over-thinking, never properly switching off and finding it hard to live in the moment, I was recommended to try a new, non-wine based, method of relaxing. Mindfulness. Mindfulness is one of those snazzy new healthy-sounding terms being bandied around in books and on the telly. So when I heard about it I thought it sounded just like the kind of ‘hippy clap-trap’ I would usually avoid (only because I’d over-think it and end up in fear of my life instead of just trying the darn stuff). So I wasn’t up for it at all, until last weekend. I’d had a headache for days. I’d topped up the local pharmacy’s income buying a barrowful of pills and nothing had helped. My head quite literally felt fit to burst. The dog was giving me her ‘walk me now please mum’ face and I thought, yep, a bit of fresh air, maybe that will do it. 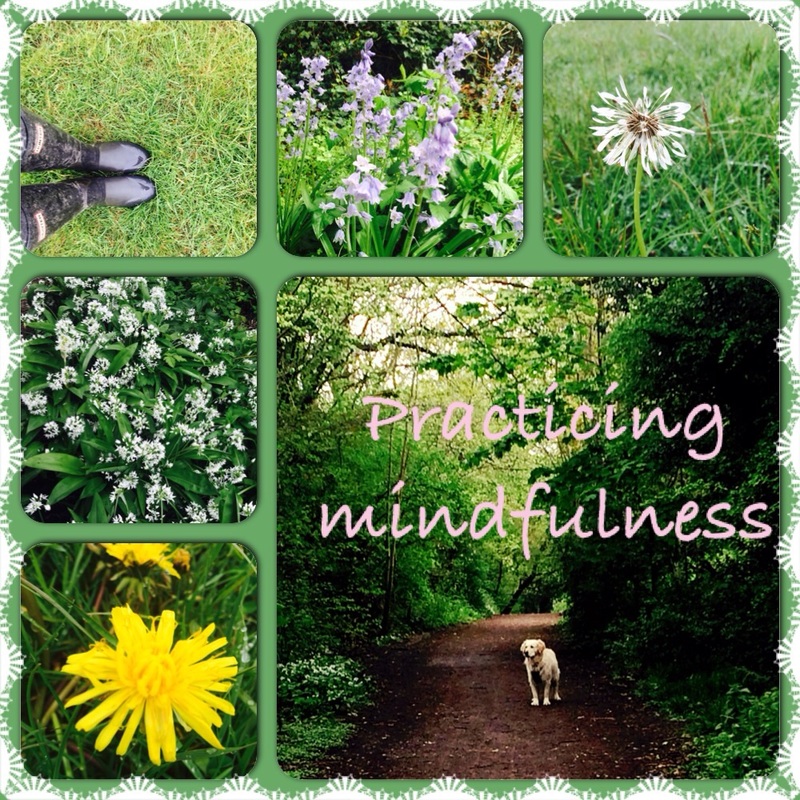 While we were out I remembered what I’d read about mindfulness and I made myself conscious of everything around me, the damp air, the wet grass, the singing birds, the smell of the fields. Goodness, it was remarkable. Just becoming aware of my senses. What I was experiencing, and focusing on it instead of thinking felt new and so refreshing. Wow, I thought. So this is mindfulness! Usually my dog walks are based on where I have to get to and from, and achieving it in as short a time as possible whilst still exercising the dog’s legs, and my own. But today, for the first time in ages, I was just absorbing the moment. The sound of the train rattling past. The cold drop of rain falling from a tree onto my neck. The way the dog moved and watched everything around her. I felt like my senses were coming back to life. At last! Hello life. I literally sucked in the air and enjoyed just ‘being’. And when a thought popped into my head ‘When should I do this? How shall I do that? What shall I cook? What time is that happening?’ etc etc I just visualised it floating off down a river in my mind. This lasted about 15 minutes in all. The walk lasted about an hour. But I am just a beginner, and it’s going to take me a while to manage mindfulness for any longer, but just those few minutes were enough to show me that this simple, quiet, NOT thinking activity, was well worth it. I really enjoyed the rest of my walk. I felt much more positive and was proud of myself for achieving something new. My headache eventually left me and I knew I wanted to do more of it. If you are an over-thinker, you might like to try mindfulness. It’s one of the few things in life that is free, achievable and available whenever you need it.